Over 325 sailors concluded their five day RYA Youth National Championships today at Plas Heli. There were outstanding performances in all classes, some Championships won with a race to spare and others came down to the wire. HRH The Princes Royal greeted the sailors in the boat park this morning before the final day of racing got underway. The day ended with 18 sailors selected to represent Great Britain at the EUROSAF Youth Sailing, European Championships which will be held in Neusiedl am See, Austria on 15-21 August. 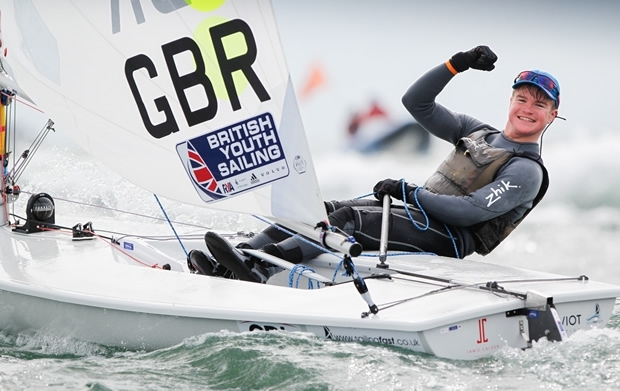 The top two female and male teams in the 29er, Laser Radial and RS:X were selected and two 420 girls’ teams to represent Great Britain at this prestigious event. Last year, Britain won five medals and will be looking to replicate that medal haul. Winning the 29er class with a race to spare were Crispin Beaumont and Tom Darling (HISC), they performed consistently throughout the week, dominating the gold fleet. Nick Robbins and Jake Todd finished second and are the first 29er boat selected to attend the EUROSAFS alongside Huw Edwards and Josh Dawson. Phoebe Connellan and Sophie Otter (Grafham Water) will attend the EUROSAFs, as will Hattie Rogers and Orla Mitchell. Isabel Davies and Gemma Keers (Itchenor) won the 420 class by a whisker to rivals Jenny Cropley (Royal Lymington) and Emma Baker (Weir Wood), both, however will not attend the EUROSAFs. Jenny’s younger sister Pippa and helm Hatty Morsley secured the first EUROSAF spot in sixth overall as well as Fenella Bennett and Emily Gent in eighth. Alex Smallwood and James Scott (Datchet) finished third overall and first boys. The points were so close between them and the other boys they didn’t know who had won until they came ashore, explained Scott: “We finished the race and didn’t know if we had won or not, we didn’t want to celebrate until we had checked the noticeboard. Especially as Dan [Atherton] and Matt [Viney] won the last race but were black-flagged in the end”. This starting penalty dropped Atherton and Viney back to third with Robbie King and Marcus Tressler (Warsash) taking the advantage to secure silver. The EUROSAF teams for the boys’ 420 have not been selected at this point. Ellie Cumpsty (CVLSC) won seven of the ten Laser Radial races and didn’t finish outside the top three in a single race. Cumpsty won this event in 2014 before finishing sixth in last years’ event, now she is back on top: “Last year was definitely a low for me not winning so it’s great to be back on top. Chloe Barr (Stokes Bay) won the Under 19 category, finishing third overall and qualifying for the EUROSAF team with Daisy Collingridge. Jamie Calder (Largs) and Jake Farren-Price (Lymington) ended their week on joint points in the boys’ Laser Radial with Calder crowned Champion on count back. Farren-Price will attend the EUROSAF championship with Ben Whaley. It was a battle to the final downwind in the Laser Standard, Sam Whaley had to beat Anthony Parke (WPNSA) by three places to take the Championship. At the first mark Whaley was winning and Parke was tenth, as the race continued Parke picked off the places to eventually finish second and claim the Championship win. Jack Butters and James King (Parkstone) continued their impressive form winning the final two Spitfire races, and end the week discarding a first and second. King was pleased with their performance and development since they attended the Youth World Sailing Championships in December: “It’s pretty awesome, we have been putting in lots of effort, and really happy to get the win. Next up for Butters and King is the new Youth multihull: “We should be getting a Nacra 15 in the summer, and we’ve also got a Nacra 17 so we’re going to get on that as well and get our hands on those boats and see how they feel,” concluded King. Andy Brown’s week was very consistent and he protected his lead in the RS:X windsurfing class on the final day to pick up the Championship win, qualifying him a spot in the EUROSAF team with Matthew Carey. Emily Hall led the girls’ fleet all week ahead of Lily Young, both will represent the British team in Austria. Mark Nicholls, Event Director, said: “This year’s Youth Nationals was fantastic, even with the adverse weather conditions all fleets ended the week with a good series on the score board. Our team for the EUROSAF event is really strong and I’m expecting us to bring back a good medal haul. "HRH The Princess Royal’s visit was one of the highlights of the week, Her Royal Highness has always been a great supporter of the event and youth sailing.